The AIRSAVE survival vest assembly is an adjustable, one-size-fits-all garment, and contains an assortment of modular pockets to accommodate stowage of survival items. The Type I survival vest is used by aircrew members of both helicopter and fixed-wing, non-ejection seat aircraft. Unique features of the Type I vest include a hoisting harness attached to the inside of the vest to accommodate a Search and Rescue (SAR) lift hoist attachment, and a two-way plastic slide fastener to accommodate hard armor operation and doffing. The vest shall have four sewn-in inside pockets. The vest shall be adjustable under each arm and in the back by reeving together overlapping vest panels. 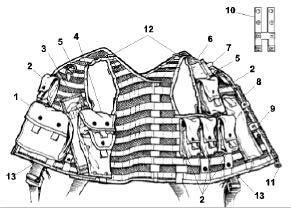 The vest shall integrate with the soft body armor in accordance with MIL-B-29605 and hard body armor in accordance with MIL-B-29604. The base fabric for the vest and the inside pockets shall be raschel knit nylon mesh conforming to MIL-C-8061, Color 106 Olive Green. The mesh shall be fire resistant treated with a chemical coating. 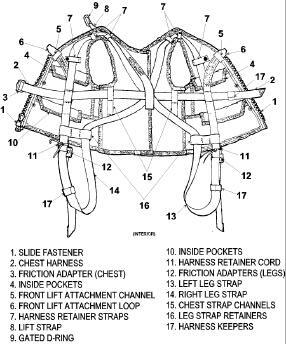 The modular pockets and the inside pocket flaps shall be fabricated from aramid oxford cloth conforming to MIL-C-43842, Class 1, Color 106 Olive Green.